For many years, owner Timothy Patrick Rooney, had a dream of one day owning a pub. When his "real job" reached the retirement stage and the opportunity came from his extended family to be the cornerstone of a new project in Old Orcutt, California, he took the leap. His wife, Jane Will Rooney, was born and raised in Orcutt and her family wanted to develop a plaza that would offer more options for the local folks. It was the love of his Irish heritage, along with his love of craft and micro beers that focused on what exactly Rooney's Irish Pub would be. 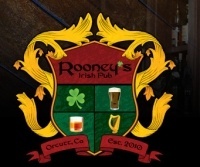 Although the original vision was that of a small humble establish, Rooney's opened in July of 2010, and has been recognized as one of the most beautiful, authentic Irish pubs on the Central Coast. With the acquisition of acclaimed chef, Anthony Endy, it now has also become a gastropub, known for its excellent gourmet pub fare. Rooney's is also a Brewpub, proudly brewing its own beers on site. Rooney's also offers an extensive 'cellar' list of fine craft brews. Jake Rooney, the owners' son and right hand man, manages the bar and can be found daily welcoming customers to this family orientated establishment! At Rooney's, "There are no strangers, only friends we have never met."